Pick a racing series. Choose a style of racecar. Name a venue. Chances are, Tony Stewart has proven victorious. The driver of the No. 14 Bass Pro Shops / Mobil 1 Chevrolet in the NASCAR Sprint Cup Series has scored 12 driver championships since he first wheeled a go-kart in 1978 at a Westport, Ind., racetrack. His most widely known titles are the three he scored in NASCAR’s pinnacle series. The three-time Sprint Cup Series champion earned his first crown in 2002 by beating veteran racer Mark Martin by 38 points and a second in 2005 when he bested Greg Biffle by 35 points. His third title was earned in 2011 after winning the season finale at Homestead Speedway to edge Carl Edwards on a tiebreaker (most wins). It was the first championship for a driver/owner since 1992 when Alan Kulwicki accomplished the feat. 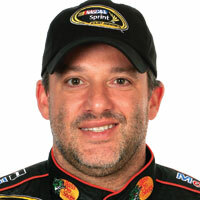 In 2009 Stewart became the first driver/owner to win a Sprint Cup race since Ricky Rudd was victorious in 1998. Stewart found victory lane five times during the season including the prestigious Sprint All-Star Race and the million dollar purse that accompanied it.